Professor Obstetrics and Gynaecology National Academy of Medical Sciences( NAMS). Consultant Obstetrics and Gynaecology Paropakar Maternity and Women’s Hospital PMWH. Acting coordinator for the faculty of Obs/ Gynae NAMS (21/06/2013 to 05/07/2013 and 06/10/2012 to 23/10/2012). 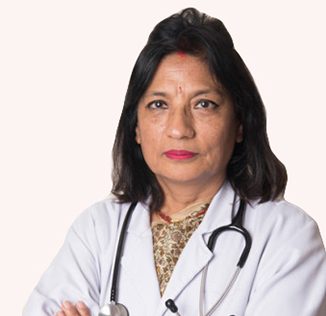 MD (Obs/Gynae) 2007 NAMS Nepal. “Legends Go Live” Pelvic Surgery workshop & CME (Sunrise hospital, New Delhi)-2017/7/1-2. Faculty Development Training of Reainers (FDToT), NAMS/National Centre for Health Professions Education, (NCHPE) Maharajgunj, Teaching Hospital Kathmandu. Advance Life support Obstetrics (ALSO), Instructor Course, NESOG,ALSO/Nick Simons Institute (NSI) Sanepa – 2014/Jan/2008. CAC training, Ministry of Health, Department of Health Kathmandu -2065/08/17. Post Abortion Care Training 1998/Nov/15-20, National Health and KUP Training Center. Training Course on Neonatal Advance Life Support (NALS)- 1998/Nov.12,PESON. Basic Ultra sound in Obs/Gynae, PMWH, Thapathali-1998/Aug29-Sept02. Norplant Implant and Removal For Trainer in Jakarta, Indonesia, KLINIK RADEN SALEH POGI & JHPIEGO-1996/Sept/22-28.